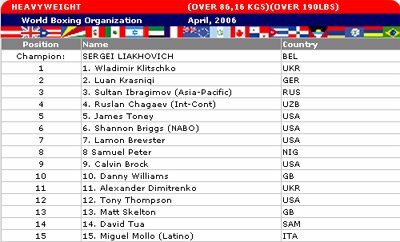 Luan moved to position #2 in WBO ranking list, behind Wladimir Klitschko of Ukraine in position #1. Sergei Liakhovich is the new Champion after defeating one of the most popular heavyweights of last year, the "Relentless" Brewster, on 1st April 2006. Brewster made a reputation by winning some top fights (including the one against Luan) but losing against Liakhovich came as a big surprise. Rematch between Liakhovich and Brewster expected. Once at the top of Luan's personal list, it is now logical to conclude that rematch against Brewster is no longer a priority to him. It must be expected that Luan is now focusing on becoming a World Heavyweight Champion regardless of the opponent.